With peace between the kingdoms secure, the rulers could focus on a long ignored problem: the aging stockpile of wizards. “Retiring” a senile wizard had to be done delicately. I used my sling to hurl an eye over the tall temple wall, but it fell uselessly into a fountain. I was going to need more eyes. The whales sang in the cool depths, each song a memory of a far-off place. The cities of the once submerged Old Coast were again accessible. Something had been making architectural changes. WW IV continued to be fought, but in remote wildernesses. The cyborgs on all 3 sides agreed that people should rebuild in peace. The waiting list for a young, healthy heart could be years, but 2nd hand cyber hearts were available every few days. We’d decorate the pine tree with used ammo casings and empty cans. The adults would sing something about someone named Santa. Feeling sluggish all morning, I realized that I’d used 99% of my monthly data plan. Could I get to the hospital before the coma? They say a wizard had opened doorways in the dry hills, releasing rivers of fresh water. But other things came with the water. If the captain had his way, he’d just use the trained octopi for crew. They were smart, good in zero-g, and rarely got drunk. The Dyson sphere was unbelievably huge. So large, it contained planets orbiting in the darkness around another Dyson sphere. Give a man a fish: they eat for a day. Teach a man to fish: they eat for a lifetime. Unless someone has fenced off the lake. No robot believed in luck. But just in case – the captain told the crew they’d be stopping off at Earth for a replacement human. Special Six Word Micro Micro Story! I’ve been competing weekly (weakly?) 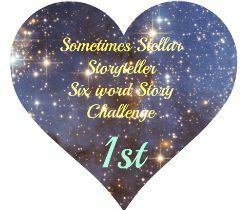 in the Six Word Story Challenge found at the Sometimes Stellar Storyteller blog. One of the challenges in December was to write a six-word story based on the word BELIEVE. Image belongs to my dad. 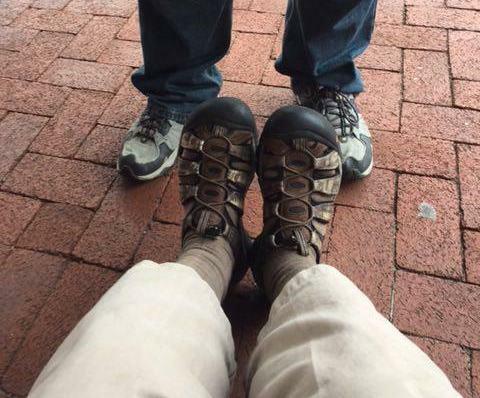 That’s his feet in the foreground, that’s my feet in the background. I will provide no other context. I make no claims to Dad’s photo, but some claims to the text. So there.